First of all you need to decide whether you are going to use your 'big bath' (if you even have one) or a baby bath. If your using your own bath then you'll have to lean over the side of the bath which can be awkward if you're holding a slippery baby - it's not easy on the knees either! 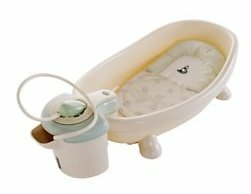 If you don't want to have to fill the entire bath - using lots of water for such a small baby - then you may want to consider using a BabyDam. These have been used for years and years and do exactly what they are supposed to do -nothing more, nothing less. They are easy to use but can be a nightmare when it comes to storage. 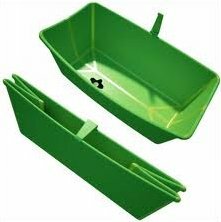 If you're short on space then a folding bath is probably best. There are some great new products out there and the Flexibath (pictured) is one of the best on the market and the only one that I'm aware of that folds flat. If you think your baby might like a little bit of luxury then why not treat them to this Summer Infant Bath. It has a battery operated soothing spa to completely relax your little one. Very posh! These are a great idea - if you have room for one. 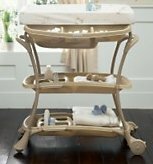 It's a combined changing station and baby bath with plenty of storage so you know you'll have everything to hand. It also means you can stand up and bath your baby without breaking your back. So you've chosen your bath but what else will you need? Again there are lots of different types available and normal towels are fine. I use a baby towel with a hood so that Little E doesn't lose too much heat from her head but you can also buy towels that you wear as an apron whilst bathing then wrap baby up with after. I always have an extra towel waiting on her changing mat too. Cotton Wool/SpongesI use both but I know people that use one or the other. I use a natural sponge for Little E's body but I use a cotton wool and a top and tail bowl to clean her face. The midwife told me not to use anything on Little E's skin - just water. Apparently, using baby products in the bath can cause eczema. I don't use any added extras but other mums have done for years without any issues. Bath ThermometerI don't trust the ancient method of 'elbow dipping' to test the water temperature so I'd recommend a bath thermometer to ensure your baby doesn't get scalded or dipped in to water that's too cold. If your new to all this baby bathing business then you can get in to a bit of a panic if you are left to do bathing on your own - I certainly did. I was worried about Mister A slipping out of my hands which is why I ended up buying a bath support. You can buy sponge ones, plastic ones and cloth ones but whichever one you choose I can assure you it will give you a lot more confidence in your own bathing baby abilities! If I've missed anything let me know! Everyone has their own way but this is how I do it. Firstly, make sure everything you are going to need is within reach and the room is warm. Fill the baby bath with 2-3 inches of water and ensure the temperature is safe for baby. Lay out your baby's clean clothes and nappy ready for afterwards. Undress your baby and wrap her in a towel. Holding your baby in the towel. Use the water from the bath to clean her face with the cotton wool. Using the sponge or cotton wool wash your baby leaving the nappy area 'til last. Once you happy that baby is clean, use both hands to lift her out. This is where an apron towel comes in handy! Wrap your baby in your chosen towel and try and cover the top of her head (that's where babies lose most of their heat from). Lay baby on to her changing mat and dry her thoroughly, ensuring you dry in between any folds in her skin. Dress baby as quickly as possible to prevent her from getting cold and wrap her in a blanket. Give your little one a kiss and smell that clean baby smell - mmmmm. How often should I bath my baby? It's entirely up to you! Most babies love being in the water and it can be a treat for both of you to have a little fun together at bath time. Most people I talk to bathe their little ones every other day - it's your choice - just make sure that you wash baby's face regularly and ensure that you clean your baby thoroughly at nappy time. Baby Safety Never leave your baby unattended. Always check that the water is a safe temperature. To start with it can seem like a bit of a daunting task but, as with everything in this World, practise makes perfect. Just have confidence in yourself and relax - you'll be a pro before you know it! Persil Small & Mighty Giveaway - 10 Up for Grabs! Happy Birthday Little E... 3 Months Old Today! Mister A's Toys R Us @TRUToyologist Entry! Voting Competitions - Love Them or Loathe Them? Win £40,000 whilst shopping the sales!